I am currently reading through 1 Kings and 2 Kings in my daily bible reading. And it is a frustrating experience. I am not really sure if anyone has ever felt so frustrated reading the bible. And before I carry on, it is not because I dun understand what was being written and what God was trying to say in the word. To gain new insights everyday reading the bible should be a given but I think there will always be part that we will not understand. It is not because the records of the the kings are boring... genealogies are much more boring than that if you want to compare it this way. I am currently reading this book called 'Listening to people of other faiths' by Claire Disbrey. It is an interesting read and the first of its kind. Most comparative religion books I have came across looked at other religions from a philosophical and most often than not, Christian viewpoint. Claire Disbrey, in this book, chose to interview people and allow them to speak for themselves what their faith means to them and how they interact with their respective faiths, without her questioning too much into the validity of their faiths and the intellectual grounding. But Jesus bent down and started to write on the ground with his finger. When they kept on questioning him, he straightened up and said to them, "If any one of you is without sin, let him be the first to throw a stone at her." 8Again he stooped down and wrote on the ground. Haven't posted anything substantial over the past few weeks. Just felt compelled to post something here tonight. 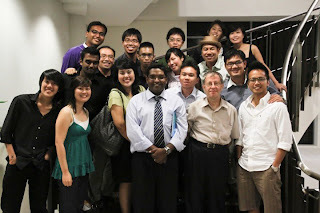 I went back to NUS last night to attend the MadHatter event organised by the History Dept. For some background, this is an event organised yearly by the history dept to celebrate the 'coming of age' for the honours year cohort every year. My batch had the privilege of being the first batch to grace this event. As we were catching up with one another, it really warmed my heart. Although most of my classmates are teachers now, and sometimes they really talk about work and teaching, we are the same beneath in our hearts. When we talk about history, we are all on the same page and our passion in history continues. It just makes me miss the time in school, and it makes me wanna pursue my post-grad in history. But that one pending for further thoughts. It was really a fun time for all of us.